Adjust the wheel above the gem setting plier jaws, opening the jaws enough to bridge the distance between opposing prongs on the setting. Place the gem setting pliers so one jaw is resting along the side of one prong and the other jaw is resting on the top of the opposing prong. 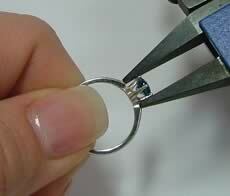 Squeeze the handle on the gem setting pliers so the jaws close, compressing the prong and capturing the stone. Turn the pliers around and rest one jaw along the side of the prong just closed, and the other on the tip of the opposing prong. 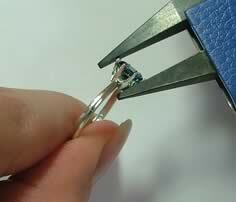 Squeeze the handle on the pliers, compressing the prong, capturing the stone. 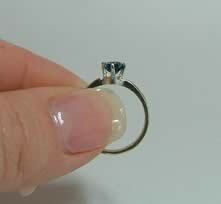 Repeat all the way around the setting until all prongs have been tightened around the stone.